Dabe: Could you maybe modify the area around Hurnscald (the woodland village) a bit so that it fits the already created maps? Just as much as necessary (moving the small bay south of it a bit south, the eastern part of the mountain ridge a bit north and the woodland village mark to the center of the cell). You can ignore all the water areas. It is not a problem to "fill" them with new land. But I would not like it much when a lot of the walkable area of the maps would be lost because I invested much work into them. Just by the way: I extended the raster to get an overview over the total effort of mapping the Argaes continent. I am counting 173 maps here. We can maybe reduce this to about 150 by moving some coastlines a bit to avoid maps with a lot of water but it's still quite a lot. Seems like Argaes will end up to be more than just a small debugging continent. Moved the watery area by Hurnscald to the south a bit; had imagined it as more of a lagoon than a bay, but whatever it ends up being is fine. 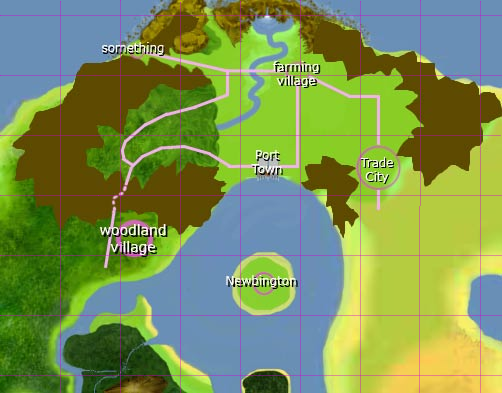 I took a stab at using TMWs logo for the shape of the island where Newbington is located. I dunno why exactly. I feel bad for the logo, having no apparent relevancy anywhere in the game's development. Without the circle around it though, it looks kind of... odd. Just playing around though.. if we prefer something simple and circle, I can always revert. Also, I will begin shaving down some of the coasts to fit a bit tighter to the grid. I can knock down at least a couple handfuls of those mostly-water maps. Crush wrote: Seems like Argaes will end up to be more than just a small debugging continent. I had hoped that it would be a place where you could spend a couple or so hours rather than a couple or so minutes, so I'm alright with that. Extend the trade city towards the port and have something suburban in-between. Sorry for my lack of time to actually read and input further. I still don't get this map, shouldn't Tumilshar be South-East of the woodland village? The current woodlands are being moved to Argaes. Where they are now will be more desert. You can see a geographic overview of the world on the wiki. I'm sure someone will be all fussy about me saying this, but I honestly don't see the current Tulimshar staying the way it is, especially when the new game mechanics begin to demand certain things of certain surroundings. Aside from that, I don't think it would hurt for some of the desert graphics to be refined and expanded upon. Our refocus toward Argaes was mostly an effort to allow players a more gradual introduction to the world, another goal was to allow the desert some refining time. I believe that once we get Argaes feeling comfortable, the first continent we should allow people to travel to should be the Tonori desert, where people can find new and improved Tulimshar.. :o we can call it TMW: Return to Tulimshar .. I agree with Rotonen, I think.. I suppose in order to know that, I have to know something about this grid; how many maps does each square represent? If it's only one map per square then yes, I definitely agree that the trade city could use some expansion. ..and a suburban area would fit there.. but if we're going to have a gradual progression from a potentially grubby port town to a fairly nice city, it should be made obvious in the housing quality..
Well.. I suppose it wouldn't look like that, but I got carried away with the doodle, so there.